This pluck foam tray can hold up to nine Universal Cavalry models. Which can be designed and customized from the convenience of your own home. At times pluck foam trays may require an exacto blade to cut through portions of the foam. 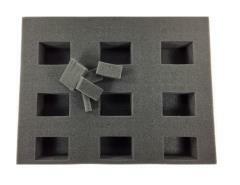 These Hybrid Cav Pluck foam trays are available in 2 inch, 2.5 inch, 3 inch, 3.5 inch or 4 inch thick. The pluck foam pieces are 3/4 inch (19 mm) squares with 9x 2 1/2 x 1 3/4 inch (64 x 45 mm) cut outs.